Originally known as Banksia Point, Rosebud began life as a fishing community in the early 1850s. On 2 June 1855, the cargo vessel Rosebud, owned by one of the colony's best known pastoralists Edward Hobson, was washed over the large sandbars and onto the beach. The burgeoning community made off with the cargo of damask and household goods, but the wreck remained for many years as the locals slowly stripped its hull to use in the construction of houses. It became commonplace to call the area "The Rosebud" in reference to the ship, which was shortened to "Rosebud" as the last vestiges of the ship disappeared. Officially the term Rosebud referred only to Rosebud Village, the blocks on the foreshore west of Eeling Creek (now an underground drain between Tom Salt Park and the camping ground). Land on the south side of "the road to Portsea" was described as being in Wannaeue; this was the name of the parish that extended south to Limestone Road. Today the name is recalled by a small street between Rosebud Parade and Ninth Avenue. The parish went from The Avenue to Government Road in Rye, but also included the Arthurs Seat pre-emptive right (now McCrae and Arthurs Seat). Peter Wilson gives much detail about the buyers of Rosebud Village allotments. Lime Land Leisure mentions a "Mr Gomm, of whom little is known." Ray Gibb's books about the Gomms (pioneers of Hobart, St Kilda, Mentone, Rosebud, Dromana, Hastings and Somerville) and the Adams family will be available from the Dromana Historical Society by the end of 2011. Allotment 20, between The Avenue and Parkmore Road, was not "settled" at the same time as the rest of the land to Boneo Road. This was supposedly due to an arrangement with Captain Henry Everest Adams, because he had been carrying convicts between Van Diemen's Land and Melbourne. This transport was probably provided in 1840 when there was a drastic labour shortage in Melbourne. Isaac White who purchased allotment 19 (west to Adams Avenue), knew Adams and probably cared for the Captain's wife while he was away at sea. He probably settled lot 19 on behalf of the Captain, who owned it by 1864. In the Argus of 12 March 1883, the Government advertised land in the village of Wannaeue on allotment 20, Wannaeue. No parish map has made mention of this village. The Adams family had a guest house, Hopetoun House, named after the Governor (a frequent guest), on the site of the car wash near McCrae Plaza. It was later renamed Merlyn Lodge. Robert Adams sold allotment 19 and the part north of Rosemore Road was subdivided but the ownership of the rest reverted to him in the Bust. Parkmore was built in 1896 by Albert Holloway and bought by the Clemengers in 1908. The rest of the land to Boneo Road was granted to speculators. Allotment 18 (west to Jetty Road) became the property of Charles BLAKEY  and then Robert White, after 18 February 1874, when the 152.5 acre allotment was advertised in the Argus. It was pointed out that a block, 66 x 330 feet, fronting the beach road, had been sold. As this was the only block separately owned for decades, it had to be Lot 86, which William Edwards mortgaged to Captain Adams in August 1878. As the land was of little value, it is strange that it was considered to provide enough security. Edwards borrowed 128 pounds and nine shillings, to be repaid with interest on 30 June 1880. McCrae was called Dromana until about 70 years ago, as the steamers had made Dromana's location well known. Isobel Moresby said that Jack Jones had built a store on the corner in about 1900 but it was built about a decade earlier just after the Lake v Jones case. Allotment 17 (west to Norm Clark Walk) came into the ownership of the Woolcotts. William Gomm was farming it in 1876 but returned to fishing when subdivision began. George and Susan Peatey were among the first buyers and the site for the state school was bought a few years later. Later residents were the McDowells after whom a street was named. Peter Wilson's book, "On the Road to Rosebud", gives excellent detail about Lot 18 (Henry Potton's Farm, the suicide), Lot 17 (church, shops) and the Clacton-on-Sea estate. The settlement remained rudimentary for many years. A school began operating in 1884 and moved into purpose-built premises three years later. The first store wasn't opened until Welshman Jackie Jones began selling goods from an upturned boat in the late 1880s. Rosebud suffered from a lack of direct access to Melbourne. When a pier was finally built in 1888, it failed to extend into the deep water, so ferries and passenger ships from the metropolis had to dock at Dromana, a larger town about eight kilometers to the north. A road was formed by clearing a path at Anthony's Nose, the point where Arthurs Seat (305 metres) meets the sea, halfway between Rosebud and Dromana. This, at last, gave Rosebud a road connection to surrounding towns and Melbourne. The Post Office then opened on 27 March 1889. In the early twentieth century, developers attempted to market Rosebud as an English-style seaside resort with the creation of the Clacton-on-Sea estate (today known as the "Avenues"). Vacant land was offered at just two pounds per block in an effort to stimulate investment in the area. Take up was slow; society wasn't affluent enough to allow many of the middle class to own holiday homes so far from the city. This slow growth continued in the inter-war years; the township consisted of about ten shops and a presbyterian church, built of wood on a single day in 1923. The first pub (the Rosebud Hotel) wasn't built until 1939-40. Built in the prevailing art deco style, it remains the only pub in the town to this day. Local businessmen had noticed a slowly growing phenomenon in the late 1930s and 1940s - the popularity of camping on the Rosebud foreshore; a cheap and interesting alternative to staying at guesthouses or hotels. After World War II, aided by the explosion in the number of people owning a car, camping at Rosebud over the Christmas-New Year holidays became a tradition for many Melbourne and Victorian families. The Rosebud Foreshore Committee was set up to administer the area and take bookings, which are now made twelve months in advance. In the 21st century, camping on the foreshore has taken on a cultural dimension and there are families who are fourth and even fifth generation visitors. Many Victorians reminisce about Summer holidays at Rosebud. By the 1960s, Rosebud had become the largest town on the southern Peninsula, complete with a shopping centre and extensive sporting facilities. In time it became home to an increasing number of permanent residents, including 'sea change' retirees. New housing estates have developed in the last five years, including the Peninsula Sands Estate in Rosebud South, home to many young families. The town's shopping strip and most of its amenities are located on an extended strip of the Nepean Highway, which runs parallel to the beach. 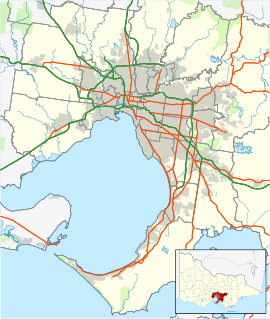 Rosebud proper extends from Lonsdale Street (the border with McCrae) for three kilometres to Boneo Road, where Rosebud West (Capel Sound) begins, while Rosebud South is a pocket of suburban streets directly south of Rosebud on the lower slopes of Arthur's Seat. In 2016, after a controversial, and at times bitter balloting process, Mornington Peninsula Shire approved the name "Capel Sound" to replace "Rosebud West". This was done to align with the Federal Government's preference for town names without directional reference. It was also seen as an opportunity to improve the image of a suburb previously viewed as being somewhat less socially acceptable to the wider community. Some residents fancied the old name had a negative effect on land and property values. Other residents had grown up in Rosebud West. They expressed dismay and annoyance that their town's traditional name might be taken from them. Nevertheless, after a long and at times painful campaign, the name "Capel Sound", taken from a small bay area to the North of the shopping village, was the one which emerged to grace the town's signboards for ever more. Rosebud is shielded by camping grounds lined with banksias, tea tree and sheoak. During the summer months and as late as Easter campers can be found in these areas. Rosebud is one of the main towns on the Mornington Peninsula mostly because of its shopping areas. Rosebud Plaza (formerly known as Port Phillip Plaza) contains 70 stores including Australian Post, K-Mart, Woolworths, Coles, Sussan, Donut King, Wendy's, Peninsula Surf Centre and Target. The second shopping centre in the town is the Rosebud Beach Shopping Centre which includes Woolworths and nearby is Peninsula Cinemas. The Public Library is located at the Rosebud Central Shopping Centre. The Centre also contains the Dimmeys discount retail store and many specialty stores including a Hairdresser, a Cafe, Pet Store and a Butchers. There is a shopping strip in Capel Sound, along Point Nepean Road. Rosebud is popular for its weekend markets, including craft and vintage markets. Rosebud is known for its fresh fruit and vegetable produce. There are many market growers in the area, including Lamantina's, suppliers of vegetables to the nation's supermarkets. To the South, near Main Ridge can be found the Sunny Ridge Strawberry Farm. In the warmer months, locals and visitors flock here to pick their own strawberries. The foreshore area of Rosebud is one of the largest camping areas on the peninsula. During the summer months the populations of Rosebud and Dromana can double in size, making for a very touristy feel. In 2016, Mornington Peninsula Shire completed the complete rebuild of Rosebud's famous Jetty. Workers replaced hundreds of metres of old timbers, fitted state-of-the-art LED (Light Emitting Diode) Lighting installations and constructed a huge "scalable" children's playground, just to the South of the Jetty itself. At 2017, a massive semi-high rise block of residential units is due for completion. Sitting at the corner of Jetty and Point Nepean Roads, it dominates the skyline for visitors as they approach the Jetty precinct. Rosebud has a temperate coastal climate, and is usually several degrees cooler than Melbourne. The annual maximum mean temperature is 19.1 degrees C.
The town centre is located directly opposite the foreshore area and local beach. The town has an Australian Rules football team competing in the Mornington Peninsula Nepean Football League. They play at Olympic Park on Eastbourne Road. They have been champion of this league six times; in 1933, 1970, 1988, 1997, 2007 and 2015. Rosebud is home to the Rosebud Heart Soccer Club  which was established in 2010. The club has 180 junior players with 12 teams playing in the Football Victoria leagues and their own mini league Soccer Champs Program. The club's home ground is Olympic Park Recreation Reserve located on Besgrove Street. Golfers play at the Eagle Ridge Golf Course on Browns Road, Rosebud, at the course of the Rosebud Country Club on Boneo Road, or at the Rosebud Park Public Golf Course on Elizabeth Drive. Cycling is also a popular pastime in Rosebud and on the Mornington Peninsula. Point Nepean Road and the Nepean Highway are used by cyclists, as well as shared trails. The Mornington Peninsula Shire has constructed almost 80 kilometers of trails, including Bay Trail: Dromana to Sorrento, Melbourne Road Trail: Rye to Portsea and Western Port Bay Trail: Somerville to Balnarring. There are several schools in the Rosebud area. A modern hospital is located on Point Nepean Road, to the West of Rosebud's main business district. The hospital forms a central hub for a range of specialist medical testing and treatment clinics. A new ambulance station houses 2 Paramedic Ambulance units, while another station on the Eastern end of the town, houses a Mobile Intensive Care Ambulance (MICA) unit. Another busy quadrangle of community services and clubs, 1 km South of Rosebud, is bounded by Boneo Road, Eastbourne Road, Hinton Street and Besgrove Street. Much of Rosebud's utility, community and emergency services infrastructure is located within this district. Rosebud's Fire Station, sits in Boneo Road near Eastbourne Road, and is staffed by Career and Volunteer firefighters. The town's Police Station is located next to the Fire station. Behind the Police and Fire Stations is the Rosebud Headquarters of Mornington Peninsula Shire. Fronting Hinton Street, may be found the district's headquarters and operations depot for Parks Victoria. North of Besgrove Street, beside the Fire station, are the Mornington Peninsula Woodworkers and the Southern Peninsula Amateur Radio Club (SPARC). An expanding industrial precinct sits off Boneo Road, about 3 kilometres South of the town centre. Further along Boneo Road, the Chisholm Institute of TAFE (Tertiary and Further Education) caters for a wide variety of subjects. Notable amongst these are specialist facilities for training apprentice chefs and a purpose built facility for students engaged in learning care and maintenance of Golf courses and greens. This ties in with the fact that Rosebud is gateway to some of Australia's most famous golf courses. ^ Australian Bureau of Statistics (27 June 2017). "Rosebud (State Suburb)". 2016 Census QuickStats. Retrieved 13 April 2018. ^ "Rosebud wins a name!". The Argus (Melbourne). Victoria, Australia. 8 January 1955. p. 15. Retrieved 23 April 2017 – via National Library of Australia. ^ Around 4,500 residents live in the western region of Rosebud, many of retirement age. ^ "Mornington Peninsula Markets". Retrieved 22 March 2011. ^ "Mornington Peninsula Shire". Archived from the original on 12 March 2011. Wikimedia Commons has media related to Rosebud, Victoria.